A special cheer to Melanie and Elaine for all their work at this year’s quilt show. The show was wonderful! Great job! 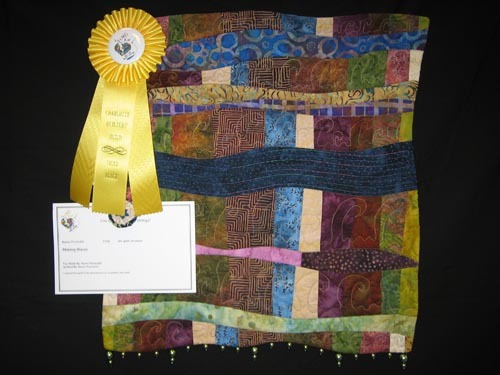 I’m so excited….I won 3rd place~art quilt small amateur in this year’s quilt show. And a special thanks to Susan Brubaker Knapp for the great picture! This year’s show was quite impressive. So many wonderful quilts and so many talented quilters in our guild. I’m so inspired. But the first thing I need to do is start to complete the numerous quilt tops I have. And with that said, tomorrow I leave for a week long vacation at the beach. Time to relax and regenerate. This entry was posted in Uncategorized and tagged charlotte quilters' guild by Karen. Bookmark the permalink.